This question I recently received is quite common: Our soils are clay, clay, clay. Where do we start? We see a lot of ads for a “one-does-it-all” fertilizer for turf. We also need to prepare beds for annual flowers, shrubs, ground covers and ornamental trees. Not sure what the "one-does-it-all" fertilizer is - may be one of the toxic chemical weed and feed products like Scott's Bonus S - the worst possible choice of all fertilizers. Atrazine is in it and it will kill your trees - says so on the label that no one reads. To go organic, stop using the toxic products. Then apply the following to the existing soil - compost, organic fertilizers, rock powders such as lava sand and greensand, and sugars such as molasses. Put the same products on turf and in beds. Cover bare soils around plants with shredded native tree trimmings. You'll have more fun, work less and have better production of all plants your first growing season. Here’s the revised basic program with more details: BasicOrganic Program. 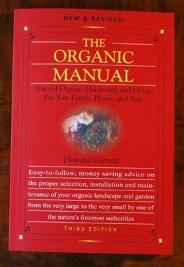 The latest information on organics can be found in my latest book Organic Manual. You can also find my books in independent garden centers, hardware stores and bookstores. Check for listings in our Products & Places.